Aries is a small constellation with great significance. The bright stars α (Hamal), β (Sheratan) and γ (Mesarthim) represent a curve. The sun enters Aries on the 19th of April and remains there until the 14th of May. Nonetheless Aries can be best observed in autumn. Aries is found to the south of the mousy constellation Trangulum and to the west of Pisces. 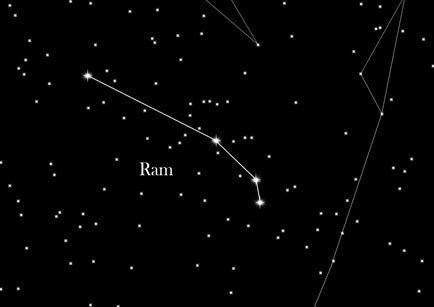 Aries shows itself as a slightly bent curve, to see an actual ram in the constellation requires a colorful phantasy. Beta Arietis is a double star system. 53 Arietis, another interesting star of the Aries constellation. Barely visible with the naked eye, it astonished astronomers with the exceptional speed with which it travels through space – at more than 160 miles per second. The constellation of Aries was first mentioned in the Mesopotamian culture, more than 5000 years ago. It was known as the Agrarian. The interpretation as a ram has its roots in the tale of the Golden Fleece. A gold-haired, winged ram, sent by the Olympians, saves Prince Phrixus from being sacrified, when he is entangled in a succession dispute. In gratitude Phrixus sacrifies the ram, which afterwards ascents into the skies. His Golden Fleece subsequently becomes a legendary relic. Even after the death of the ram it maintains its central role in Greek mythology, for example in the famous Argonautica. Astrological meaning: Those born in the sign Aries are said to be passionate and determined. Headfirst through the wall is the credo of the Aries. His honesty and sympathy make him a pleasant man.